Can can one person possibly brings gifts to all the children of the world in one night? That’s many-a-child’s first skeptical query about the Santa Claus story. For parents so inclined to provide a modern answer to that question — and for anyone looking for some online Christmasy fun — there are several websites and smartphone apps that purport to give the exact real-time GPS coordinates of Santa as he makes his way around the world delivering presents on Christmas Eve. Below is a review of our three favorites. A note to parents: None of these Santa-centric websites seem to agree on exactly where Saint Nick is at any given moment. We suggest you stick to looking at one, lest you provoke more questions than answers. NORAD has been keeping an eye on treats to North American air space since the 1950′s. And, for almost as long, they’ve been tracking Santa’s reindeer-fueled flights too. 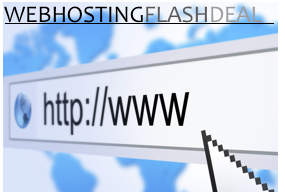 It started in 1955 when a department store in Colorado Springs, USA advertized a service that let children talk to Santa Claus by telephone on Christmas Eve. By mistake (or not? ), the number published with the ad was for the military’s Continental Air Defense Command Center. The ranking officer on duty that night — one Colonel Shoup, who would deserve a place in The Christmas Hall of Fame if there were such a thing — instructed his staff to inform all the children who called what Santa’s “current location” was. And thus began a NORAD tradition of tracking St. Nick’s. 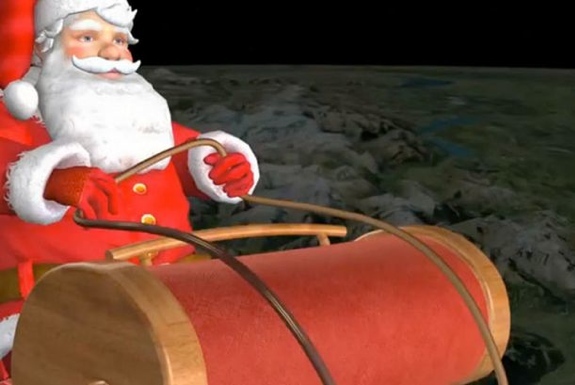 Since 2007, NORAD has run a website mapping Mr. Claus’s Christmas Eve voyage. The NORAD Santa Tracker initially launched using Google Maps, but in 2012 they’ll be switching to Bing Maps and The Cesium Virtual Globe. The website is available in a variety of languages and features HD videos of Santa’s progress. If you’d prefer your Santa updates in increments of 140 characters or less, there’s also a popular NORAD Santa Tracker Twitter account. 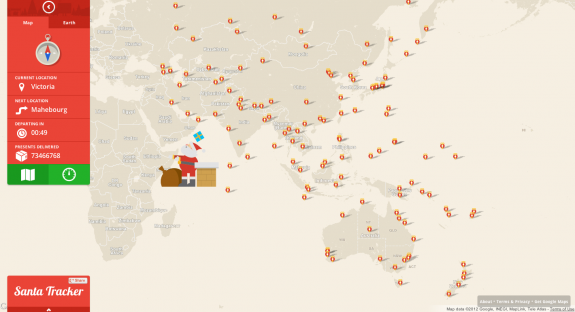 NORAD’s switch to Bing officially ignited a Santa tracker war with Google, which is launching it’s own website this year. The Google Santa Tracker is the work of an entire team of Google engineers who, apparently flush with spare time, developed “new route algorithm” to keep tabs on Father Christmas. In addition to following Santa on the Google website you can also get updates via an Android app, a Chrome browser extension, Google Earth and a Google+ account. Plus, you can request a phone call from Santa! It all kicks off at 2am PST (-8 GMT) on Christmas Eve. Google’s Santa Tracking app (see above) is only for Android. But iPhone users needn’t be left out. 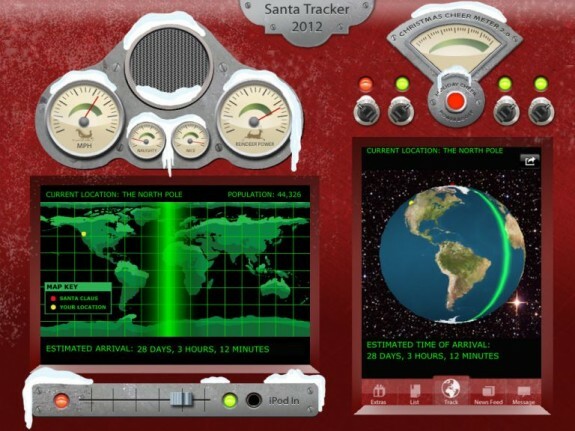 The confusingly-similarly named Santa Tracker 2012 app pinpoints Saint Nick’s GPS coordinates as well. You can also use the app, which is especially great in its HD incarnation, to read the North Pole blog, send text messages to Santa and find out where your kids (or you) are on Santa’s nice & naughty list.